Luxurious and refined, uplift your dining room with this elegant side chair. Featuring an upholstered cushion seat, this chair is beautifully designed while also maintaining an impressive level of comfort. 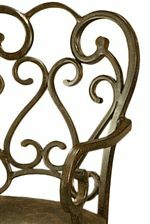 Scrolled metalwork along the seat back lends a visual element to draw the eyes from every angle, and gently curved legs give a sense of shape and movement to the traditionally fashioned chair. 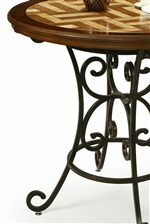 Crafted from iron with a rich autumn rust finish, this piece is structurally sound and incredibly refined. 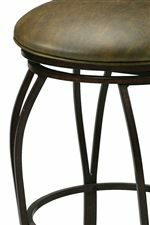 Dress up your dining space and revel in the comfort and class of this dining side chair. The Magnolia Dining Side Chair with Scrolled Metalwork by Pastel Minson at AHFA in the area. Product availability may vary. Contact us for the most current availability on this product.